Welcome to the Tottoos Store! After you have made your selections, please complete the checkout process for payment instructions. For your protection, we will never ask for your credit card number. You also have the option to send us a paper check by mail. Please contact us if you would like to pay by paper check method. MD RESIDENTS: In accordance with state law, Tottoos.Org collects sales tax for all orders shipped within the state of Maryland. Tax-exempt entities, please contact us. The current MD state tax rate is 6%. This amount will be calculated for you during the checkout process. If you have any questions about using Tottoos after you receive them, we will gladly assist you. 1. Each Basic Tottoo includes two (2) lines of personalized information (limited to 25 characters, including spaces, per line). 2. 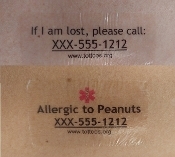 For Medical Tottoos, you will have three (3) lines of personalized information. 3. The default font for our Tottoos is "Trebuchet MS", and the font color "Black". If you prefer a different common font type and/or color, please let us know with your personalization information. Please keep in mind that more text equals smaller font size. If you need assistance or ideas on the personalization, please feel free to contact us! Please note: Due to the personalized nature of Tottoos, no returns or refunds can be made after your Tottoos have been printed (generally 24 to 48 hours after receipt of your customization information). Shipping and handling is $2.00 per order, regardless of the quantity ordered, per ship to address. Due to the custom nature of our products, processing and shipping time can take up to 2 weeks (longer if outside of U.S.). Bulk or large orders take slightly longer to ship. If you require RUSH processing and/or shipping, please let us know at time of order (additional charges will apply). We welcome your feedback and would like to know how you heard about Tottoos, and how our products have helped your family. If you have a story you would like to share, please contact us. Thank you for your business and support of Tottoos.Org! !